Topps Tiles asked me to share some of my tips for getting children to help around the garden and home to help them learn some key life skills, and to start us off they sent us a lovely bundle of DIY goodies. * Start by growing something simple that will give quick results. We've made cress heads in the past and I loved the little grass head been kit that we were sent - the children love coming down each morning to see how he is getting on. You don't need a kit, you can easily make your own cress heads or you can simply grow cress on a paper towel. The seeds start to germinate within a day or two, and in a couple of weeks you'll have a lovely crop. * If you are planting vegetables outdoors in the vegetable patch, choose something that your children will eat. We've had a lot of success with tomatoes and carrots, and strawberries are brilliant because they will give you a continuous crop over the space of a few weeks. You don't need to grow from seed, garden centres sell plants which you can re-pot or plant in your garden. * Use the process of growing something as a learning opportunity for children. A classic example is the bean in a jam jar where children can watch as the seed germinates and sends out roots, and you can help children to keep a bean diary as it grows. * Provide children with child sized accessories like gardening gloves, trowel and a trug or wheelbarrow. I have a post on my other blog suggesting some essential supplies for gardening with toddlers. Mia loves the gorgeous gardening gloves we were sent and they make her feel really grown up! * Bird feeders are a brilliant way to encourage birds to your garden and for children to learn about the different types of bird that they can see. We built this awesome bird feeder that attaches to the outside of your window. I've put it at the front of our house because the back garden is frequented by cats, hopefully we'll get some feathered visitors! * Children can be a great help when you are assembling flat pack furniture. They can count out the fixtures and fittings and match them to the inventory to make sure that you're not missing anything, then they can hand them to you as you need them. They'll love playing with all those big cardboard boxes too! * Give children their own set of little toy tools so that they can play along, the more realistic the better. 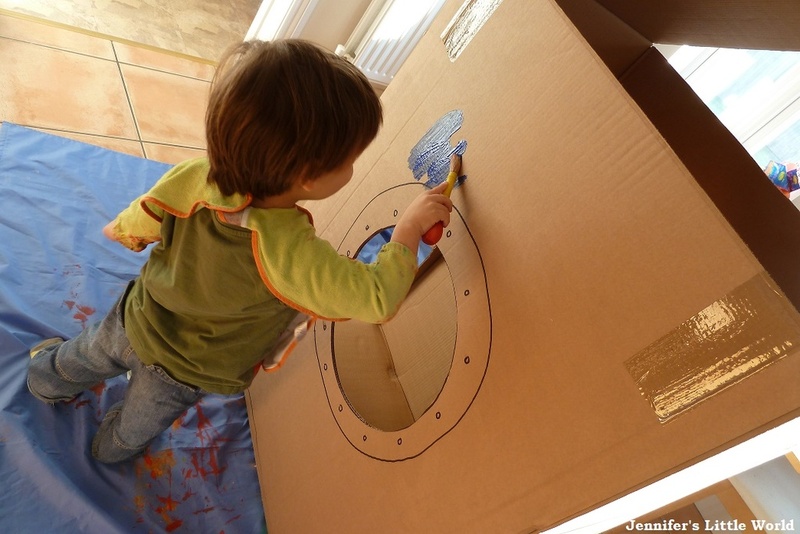 You can make a toy workbench from a sturdy box like a shoe box and let children hammer pretend nails into it. * If you are working on something that is too dangerous for children to help with, for example putting up a curtain rail or bookshelf, allow children to watch (supervised and from a safe distance!) so that they become familiar with the process and see how everything fits together. * Children love helping out if you are painting. It's probably best to have them help with the undercoat rather than the final coat, but they will love being allowed to paint with real paint on the actual walls. Make sure that they are wearing old clothes and that all the surfaces are well covered! Do you involve your children in DIY? What tips would you add? I was sent a bundle of goodies from Topps Tiles in exchange for this post, with some lovely projects for us to get stuck into as a family. We moved into our new house back in January 2012, and shortly after that we bought ourselves some dining room furniture which came in lovely large boxes. "Brilliant!" I thought "Big cardboard boxes are so much fun, let's make something cool!". Harry and I spent a really fun afternoon making a space rocket. I even took a few photos with the vague idea that I'd blog about it someday, certainly not expecting it to take this long! I made a pointed roof and cut a large circle in the side for the window, then we painted the whole thing blue. 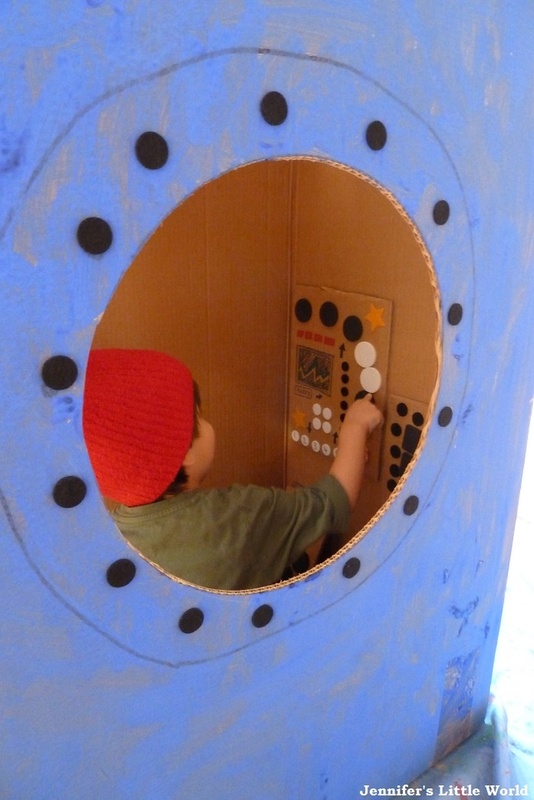 It had a door that opened and shut, and for the inside we made a control panel with raised stickers and moving steering wheel. I found him a hat that he could use for a space helmet, and he loved it. It was pretty awesome if I say so myself. Mia was crawling at this stage, and so she would get inside it too and they played in it beautifully. We found a temporary spot for it in the corner of our new dining room, and there it stayed. And so we fast forward three and a half years and yes, the space rocket is still there. It is as much a part of our dining room as the new table and chairs. Over the years it has been modified somewhat, various play dates have involved decorating it with stickers, the roof and sides have been reinforced with patterned Duck tape and after the door fell off I replaced it with a piece of cheap fabric to make a curtain. The control panel, steering wheel and original stickers are long gone. It has become so much a part of the room that we barely notice it any more, and it wasn't until I took this photo (for which I had to move the table and chairs out the way) that I really realised just how scruffy it looks, especially in our dining room where in theory we entertain our guests! But the thing is, this space rocket is probably the most played with toy in the entire house, and I'm not lying to say that it is in play daily. Many of the other toys we had at that time are long gone. Even the Duplo isn't played with as much as the space rocket. It's not used as much for blasting into space now, it has become a den, a hidey hole, a place to store little toys and a hiding place for teddies. If something is missing, it's the first place that I look. Several times the rocket has come very close to the recycling bin, and yet when it comes to it I just can't do it. It takes up so much space, and yet I can't imagine the dining room without it. I really think it'll be here until they leave home! Would you have put up with it for this long? Finally! It has felt like such a long time coming, especially when everyone else in the country seems to have started their summer holidays ages ago! I have really fond memories of last summer (I wrote about it here), it passed in a haze of Hama beads, barbecues, loom bands and sunny days out. I made a big list of things that I wanted to do last summer, and we didn't even come close to finishing it, but it gave us a good starting point for activities that we wanted to do, and we came up with even more fun ways of spending time. This year I had a few more ideas of my own, and I invited the children to contribute to the list with their own suggestions. It's not as fancy as the many that I've seen on-line, but we'll add to it as we go along. One thing that I do really want to do this summer is to get Harry riding his bike without stabilisers. Poor thing, his bike is a little too small for him but we are reluctant to get him another just yet because it feels as though he has hardly ridden it, we just don't seem to get the chance. The idea is to get him riding confidently, then for Christmas or his birthday we will buy him a new bike and Mia can have his old one. He has such skinny little legs that he struggles to get it moving sometimes, so I'm hoping that if I can get him out on it most days it will build up his muscles a little bit, and then we can work on taking off the stabilisers. It's definitely a skill that he needs to have! I've also signed him up for a week of intensive swimming lessons, something else that he should really be doing by now. As you might guess, I spend more time with him concentrating on indoor, crafty activities rather than the outdoor, more physical ones! Hopefully we'll get away camping again a couple of times, even if it's only in the back garden. Harry is well into learning about space at the moment, so I might even get him up for the Perseid meteor shower in August if the sky is clear. We bought some new garden furniture recently, perhaps I'll get the chance to relax in the garden for a little bit while the children play (that is probably just a fantasy) and I'm sure we'll have plenty of barbecues whenever the weather is nice. What do you have planned for the summer, do you make a list or do you just take each day as it comes? 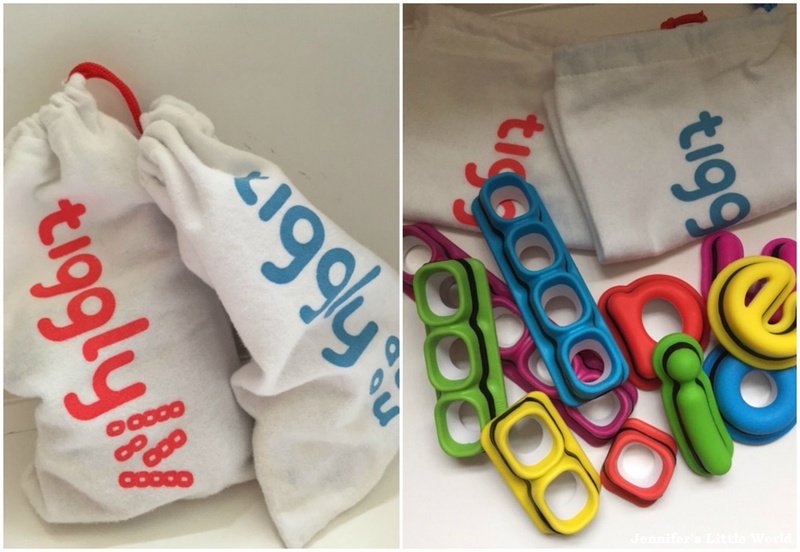 Tiggly is a set of physical smart toys that interact with a series of learning apps. The system combines physical and digital play, and will be launched in the UK on QVC on July 24th, 2015. Ahead of the UK launch we were sent two Tiggly products to try out - Tiggly Words and Tiggly Math. There is also a third Tiggly set available which is aimed at slightly younger children - Tiggly Shapes. Each set comes with five plastic smart shapes which are used to interact with the apps. Tiggly Words comes with a set of five vowels, and Tiggly Math comes with five number rods. The shapes are sturdy plastic, and the app was very responsive to them. You then just need to download the apps to your tablet, and it's a very simple process. Mia and I started playing together with Tiggly Math. There are three apps available - Tiggly Addventure, Tiggly Chef and Tiggly Cardtoons and the set is aimed at children aged 3-7 years. We first spent a couple of minutes looking at the number rods and counting the holes, then we started with the games. Tiggly Chef - Tiggly Chef was the first game that we tried and her favourite. You need to make meals by collecting a certain number of ingredients as they appear on the screen. Different combinations of numbers and ingredient appear in turn, and when you find spot the ingredients that you need, for example three tomatoes, you touch the appropriate number rod against the screen to add it to the saucepan. In this case you would use the number three rod, or you could also use the number two and then the number one rod in turn. The game starts off very simply with only up to five ingredients at a time, then as you progress through the rounds you need to use more than one number rod and add them together, to collect, for example, seven mushrooms. By the third round children are adding numbers up to twenty, and you can use any combination of the rods to make the total. I've not done a lot of maths with Mia, and so she needed help, particularly when it came to understanding how to add the rods together to make the larger numbers. What surprised me though was how quickly she picked up what she needed to do. We'd only been playing it for a short while and she was already getting pretty confident at learning how the smaller numbers added up. I can see that once she's been playing it for a bit longer it's really going to get her going with some basic maths skills. Each meal is completed quickly, and she loved seeing the finished product once all her ingredients had been added, it was a perfect game for her short attention span. Tiggly Cardtoons - Then we moved on to Tiggly Cardtoons. You touch one of the number rods on the screen and the same number of coins will appear. You can count them and move them around, then the corresponding number of pieces of cardboard will arrange themselves into a little animated scene which Mia loved watching. This app was a little too simple for Mia as it is aimed more at younger children, but it would be perfect for children that are just getting started with learning to count. Tiggly Adventure - Finally we tried out Tiggly Adventure. In this game you need to help the Tiggly character on an adventure by building bridges and ladders to help him negotiate his way around obstacles. This game teaches the concepts of horizontal and vertical number lines, and also introduces skip counting. Again Mia did need help at the beginning, but she picked up the skills very quickly which I was impressed with, particularly the skip counting which is another concept that she's not had any introduction to. Next it was time to try out the second product - Tiggly Words. Tiggly Words is aimed at children aged 4-8 years old, so having just turned four Mia is very much at the beginning stage. Although she can recognise a few letters, she hasn't yet learned about putting them together to make words. Harry on the other hand is a confident reader. Again, there are three apps available - Tiggly Submarine, Tiggly Doctor and Tiggly Tales. Tiggly Tales - This was a very good basic game to start with. On the screen you have two consonants, and you can use your vowel shape to make CVC (consonant, vowel, consonant) words. Of course not every combination makes a word, and in that case your 'word' will ping away, but every time a real word is made a picture will appear on screen and these elements will then interact with each other. You can touch the top of the screen to easily change your consonants and then experiment with the different vowels. It's a lot of fun even if they don't really understand yet what they are doing, and it's a great introduction to the sounds that different letters make. Tiggly Doctor - Both children very much enjoyed playing Tiggly Doctor. You need to treat different patients by carrying out various procedures which are spelled out on screen, for example 'check' and 'cut', with the child needing to select a matching vowel to complete the word. Mia wasn't able to read the words, but she could easily find the matching letter and over time she'll understand more about what she's doing. It was lovely watching her play the game with Harry because he was reading the words out to her and they were learning together. Tiggly Submarine - The final game, Tiggly Submarine, was a little more complex to get started with and I needed to help show both children what to do. You pilot a submarine around the ocean and use your letters to carry out different tasks, for example rescuing trapped animals and learning about sea animal sounds. They still need to have a good go at this game, but it looks like a lot of fun. I was really impressed with the Tiggly learning games, both by how long they held their attention, and by how quickly Mia in particular was picking up new concepts. Harry was quite happy to play these games by himself but Mia still needed a lot of help and to be honest that is how I'd prefer her to play these games, because then I can talk it all through with her while she is still learning. I really like that there is a range of apps for each set of shapes, and they are so different that they are suited to the interests of different children and their stages of development. You can see a great unboxing video along with a chance to see the games in action over at Emma & 3 and Being Mrs C has taken a detailed look at all three Tiggly products. 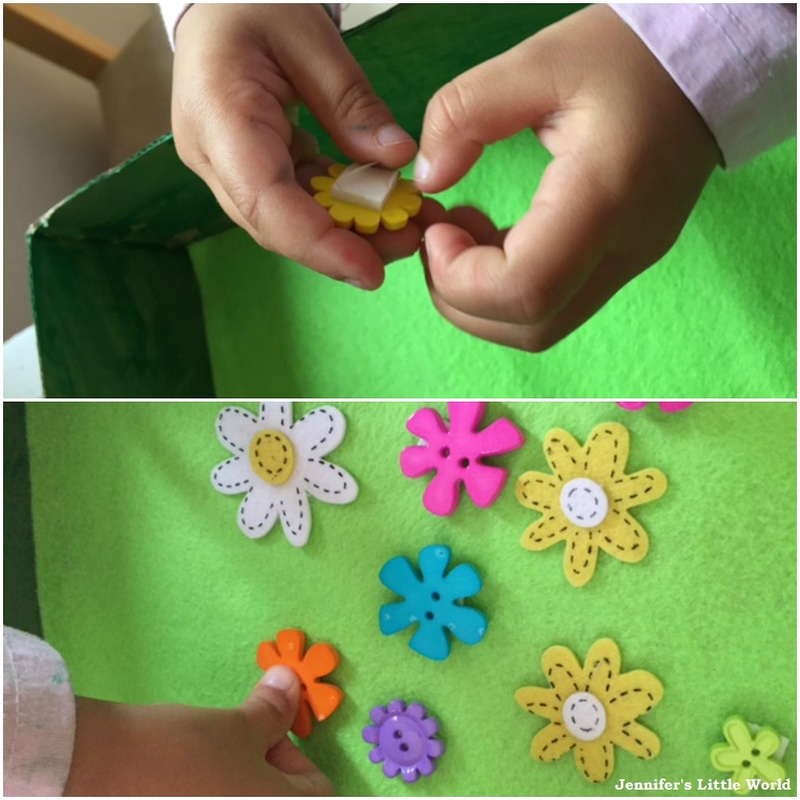 We received Tiggly Words, Tiggly Math and a Tiggly plush toy in exchange for this review and the giveaway. Amazon links are affiliate. This month my Bostik Bloggers craft box had an Outdoors theme. 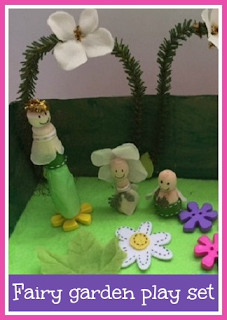 When I saw the little wooden peg shapes I instantly thought of a craft that I've been meaning to try for some time - decorating peg dolls - and with all the garden themed bits and pieces I decided that we would make a fairy garden play set for them to live in. Making homemade toys with children is brilliant because they have just as much fun with the crafting as they do with the actual playing. Mia and I made this together and she really loved the whole process. To make the play scene we used the cardboard box that the craft materials came in. I cut off the flaps and Mia painted the inside of the box green, then we lined it with a sheet of green felt, glued down firmly. To decorate the inside of the box we used fake leaves, button flowers, flower stickers and some small artificial tree branches. To stick the different embellishments inside the box we mainly used Bostik foam pads. These are small double sided sticky pads and they were brilliant, Mia could easily peel off the backing herself and they are so sticky that they stayed firmly in place. They are great because they adhere instantly, and you don't need to hang around waiting for the glue to dry. I also used them to secure the bottom of the artificial branches to the box and they have remained firmly stuck. Mia had a lovely time sticking down all her flowers to decorate the garden. While she was doing that, I made the fairies. I decorated the wooden pegs with scraps of tissue paper, ribbon, and artificial petals. Everything was glued down with the Bostik Glu Pen which has a fine nib so it's really good for detailed glueing. Like all liquid glue it takes a few minutes to dry, but once it was dry everything was held firmly in place. Mia really loves her fairy garden, she is so proud of it and she's been playing happily with it for ages! A few days ago I completed a project which I'd been meaning to get to for quite a while (years in fact...) - I finally made some little curtains and fabric bunting to decorate our summerhouse! I wrote earlier in the year about my plans for this summerhouse, and I'm so pleased with how it is looking now. I was recently very kindly given a sewing machine by a friend's Mum, and a quick lesson in how to use it. I've always been a bit terrified of sewing machines, despite gaining my "Sewing Machine Driving Licence" back in secondary school. I don't understand at all how they work, and they worry me when they go too fast, as if they are going to speed off out of control. I knew that I wanted to get to grips with it though, and I decided that some simple bunting and curtains would be good practice for sewing lots of straight lines. I started with the fabric bunting, and used a template and tutorial that I found here - How to Make Reversible Fabric Bunting. Although I didn't attempt bias binding to attach the flags, I just sewed them straight onto a piece of ribbon - baby steps! They are attached to the summerhouse with cup hooks at the top and drawing pins at the ends. I know that they will fade as they are exposed to the elements, but they were so easy to make that I can see myself making many more sets over the years! I hope that the fact they are double sided will mean that they last a bit longer than if they were just cut from the fabric. The fabric that I used came from some fat quarters that I received to review a little while back and a cheap bright pink pillowcase from Asda! For the curtains I purchased some new fabric in Hobbycraft. I spent ages choosing, not wanting to spend too much and yet not really liking the cheaper fabrics. The fabric that I chose cost £6 per metre, I bought two metres and had plenty left over, and I'm really pleased with it. To hang the curtains I used cheap net rods at 99p each from Dunelm, with holders that screw directly into the insides of the window frames. Again, I know that the curtains will fade over time, but they were so easy to make that I don't mind making more in a couple of years! I was so pleased with how well I got on with the sewing machine. With the help of the instruction manual I was able to change the thread on the top spool and rethread the machine, wind some new bobbins, and insert and thread those up as well. My seams were even reasonably straight. It's definitely given me the confidence to try out some more simple sewing projects! The summer holidays are fast approaching, and along with them several weeks that need to be filled with fun activities for the children. 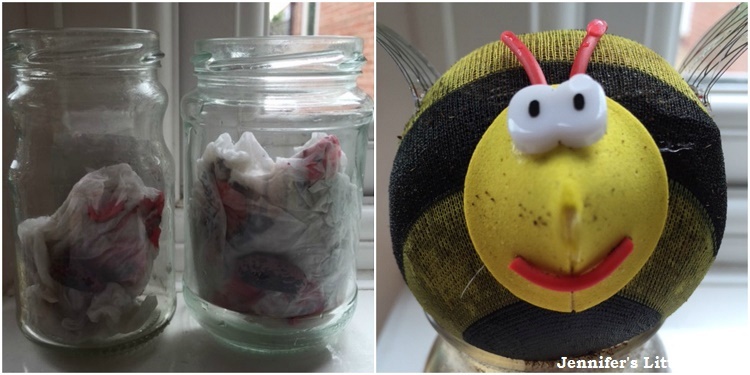 I do love spending time at home with the children, but I know that I need to be organised and plan activities in advance, and it's always good to have something on hand for those "I'm bored!" moments. I received a lovely box of crafty bits from Baker Ross to help keep the children entertained, and we had a lot of fun crafting. I really love the pack of Weather Foam Stickers and I can think of loads of ways to use them. There are pleny of different designs in a variety of sizes, representing all types of weather. I helped Mia to make a weather dial which is similar to one that Harry has in his classroom at school. She loves running over to it every morning to set it to the correct weather for the day, and changing it throughout the day as necessary. One of the things that I love about the Baker Ross craft kits is that they are brilliant for play dates. It's great to have a simple, reasonably non messy activity on hand when friends are visiting, and we had a lot of fun decorating these Music Shaker Kits. They are a simple cardboard tube filled with beads that you can decorate with paint, pens, stickers and so on, with a fun finished product. We also had a lot of fun with some Solar System Scratch Art decorations. We've received similar kits in the past and with 12 in a pack they are great for entertaining a larger group of children. Each design comes with a stick to scratch off the black layer and reveal the colours underneath. 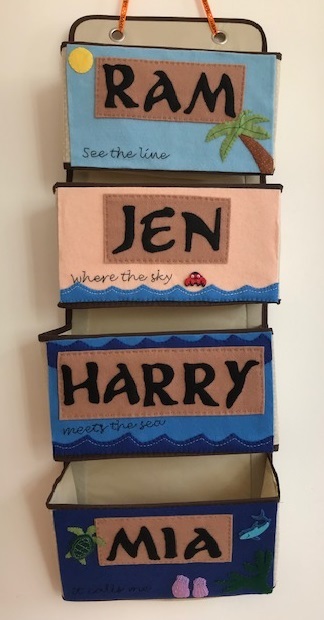 They are fab for all ages, younger children are happy to scratch away until most of the black is gone, older children can scratch out more complex designs. Also in the box were some Fruit and Vegetable Card Shapes which Mia in particular loved. There are ten different designs in the pack, all simple fruits and vegetables that she could identify straight away. I realised that as well as having fun decorating them we could turn them into a display poster for her room, with the names to help her as she begins to learn to read. We started by painting the shapes with poster paints. The fruit shaped card does have a slightly shiny surface so the paint didn't cover that well, and with hindsight acrylic paint would have been better. It didn't matter though as I was intending to decorate them on top of the paint. We used all sorts of different collage materials - pom poms, sequins, pipe cleaners, feathers, fabric petals and so on, and we were really pleased with our finished poster, it's so bright and cheerful! Finally we received some great painting supplies which are going to be a big help as we do a lot of painting in this house! A nice big Super Value Spash Mat which I am saving until our current one has fallen apart and some brilliant Painting Water Pots. These are great because you can fill them with paint or water and if they are tipped over the liquid doesn't spill out. I was also impressed with the Paint Pot Tray which could also be used to hold glue or small decorations like sequins or pom poms. The individual pots fit nicely into a larger tray to keep them together, or you could share them out amongst a group. Previously I've just used old margarine tub lids for holding paint, which is fine for when they are little but as they get older and take more pride in their painting they want the colours to be kept separate. Here Mia is busy painting her shoebox which she needs to decorate and fill with personal bits and pieces ready for when she starts school in September, eek! I blogged recently about how I'd been inspired by BritMums Live to try my hand at patchwork again, and I'm so proud of myself now for finishing my patchwork mobile phone case! I'm afraid that I can't really offer a tutorial for the phone case as I made it up as I went along. I started by creating my piece of patchwork, made using the English paper piecing technique where you tack the fabric around paper hexagons before sewing them together along the edges, then remove the paper pieces. You can find a good introduction and tutorial for the technique here. Each of my hexagons measures one inch across, and I made a long strip four hexagons across which was long enough to go around the length of the phone twice with some left over for a flap at the end. It was pure luck that the pattern worked out allowing me to match the hexagons over the flap! I backed the patchwork piece with some lining fabric (actually a cheap pillowcase) and sewed up the sides using my sewing machine. I was recently very kindly given the sewing machine by my friend's Mum and I'm still learning how to use it so it was a great opportunity to have some practice and become more familiar with it. The flap is closed with a piece of velcro. I toyed with the idea of adding some padding inside but I'm glad that I didn't as I think it would have made the case far too bulky, it's quite soft enough as it is. The case isn't finished to a particularly high standard, the stitches are probably way too visible and the inside of the flap is a little bit of a mess (not to mention the wonky sewing machine seams), but I made it all by myself and I'm very proud of it! The dark green flowered fabric is Nel Whatmore Sketch Book and was in my BritMums Live goody bag from Lady Sew and Sew. As an avid crafter with Hama beads, I've blogged before about my frustration with the cheap, imitation beads that you can buy. They can be super cheap, but they are pretty rubbish when it comes to using them for making Hama bead patterns in the usual way. However I have found a few ways that you can use the beads slightly differently to produce some fun crafts, and one of these is making beads for a melted Hama bead bracelet. You can use Hama beads to make bracelets with as they are of course, and there are some lovely, creative ways that people thread the beads to make different designs. But I recently tried melting the Hama beads individually first, and I was really pleased with the result. Firstly it’s a good idea to decide on a colour scheme for your bracelet. Hama beads come in all different shades, and if you have a mixed box of beads it can be a bit overwhelming to have all the colours included. For my bracelet I used a mixture of pinks and purples, along with a few white beads. Take an ovenproof tray and grease lightly or line with baking paper. Place the beads upright on the tray, making sure that they are not too close together or touching. Place the tray in the oven at 200C for approximately 2-3 minutes. 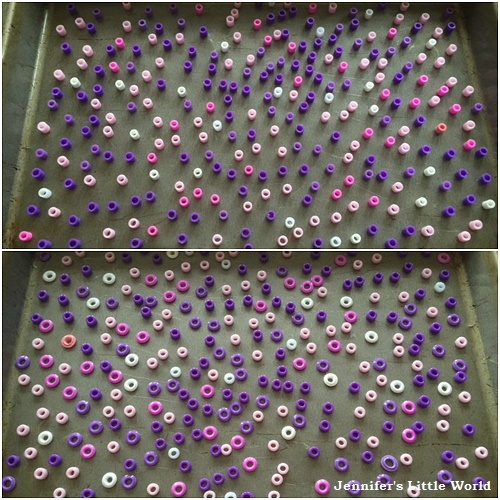 Keep a close eye on the beads while they are in the oven. You will see them start to melt, and you need to remove them before the holes in the centre of the beads are too small. You don’t need to worry about melting the plastic as long as you are watching the beads closely, it’s quite safe! The beads will go all shiny and smooth as they melt, and the finished beads have a really nice shape to them. Wait until they have cooled before removing them from the tray, as when they are hot they will be a bit sticky and might lose their shape. You'll probably want to give the beads a quick wash when they have cooled if you used oil to grease the tray. Then thread the beads onto some elastic or similar to make the bracelet. You can either make a design or place randomly. I was really pleased with how mine turned out and I think it looks pretty cool! One of the things that I loved about BritMums Live this year was the Craft Lounge, hosted by Lady Sew and Sew and Make it Coats. I didn't get there until the second day, and I really wish that I'd spent more time inside. It was a great place to chill out, chat, and concentrate on something creative. I've always loved the look of patchwork, and I remember my Mum teaching me with paper hexagons when I was little, although I didn't stick at it for long. My Mum made me a gorgeous patchwork quilt, and we also have a few other little baby quilts that she made around the house, Mia uses them when she's playing with her dolls. I did attempt some patchwork a couple of years ago which unfortunately turned into a bit of a patchwork fail, but when I saw a sewing table in the Craft Lounge with help to make a couple of simple paper pieced hexagons I thought that I would give it another try. It was much quicker than I remembered to sew a couple of hexagons together, and I really enjoyed the process - tacking the fabric around the paper hexagons and then sewing the pieces together. So I was really pleased to get home and find a fat quarter from Lady Sew and Sew in my goody bag. 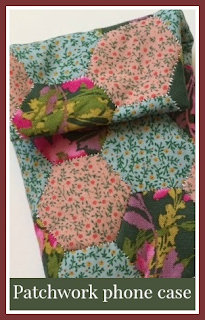 It's a lovely green flowery fabric and I knew that attempting some patchwork would be a great use for it. I found some other bits of fabric in my stash that I thought matched well and chose to stick with just three different fabrics. I wanted to start small, and so I decided to make a little case for my phone. I was quite surprised by how easy I found it! Once I'd got the hang of the pattern I was flying, busily cutting up paper hexagons, fabric hexagons, tacking around and sewing them together. I must admit that I'm not entirely sure where it will go from here. I have made a paper template and I'm intending to make a long strip that I can fold over to make the case, insert some wadding for protection, and then back it with some lining fabric and perhaps some velcro to close. I'm pretty much making it up as I go along, so we'll see how it turns out!